In Red Bull GmbH v Big Horn UK Ltd & Ors  EWHC 2794 (Ch) Master Clark completed the judgment”I conclude by noting the regrettable extent to which this judgment has been lengthened by the determination of the procedural points of little or no merit advanced by the claimant in support of its strike out application.” The judgment contains an interesting discussion of the various procedural points raised by the claimant. The claimant manufactures an energy drink using a bull as its trade mark. It sought strike out, summary judgment and judgment in default in relation to the defendant’s use of an animal n its drinks known as “big horn”. The Master dismissed the claimant’s application for default judgment. It was made in unusual procedural circumstances. The defendant, against whom default judgment was sought, had already filed a defence. The application for judgment in default is based on the fact that D2 has not filed an acknowledgment of service. The claimant’s counsel submitted that since the order for service by alternative means provided that the deemed date for acknowledging service was 7 May 2018, and none had been filed as at that date or when the first application was made on 8 June 2018, the claimant was entitled to judgment. She relied upon Almond v Medgolf Properties Ltd  EWHC 3280 (Comm)). This is authority for the proposition that if no acknowledgment of service or defence has been filed at the date of the application for default judgment, then its subsequent filing before the hearing of the application does not disentitle the claimant from obtaining default judgment. (4) an order extending the time for service of the claim form and particulars of claim by 1 month from 6 August 2018 to 6 September 2018 to allow the claimant to serve D2 at its new address (using the Foreign Process Service). The order of 6 August 2018 was made on this basis, namely that it would not prejudice the opportunity D2 had at that point to defend itself. In these circumstances, it was in my judgment, implicit in the order, that the deemed service provided for by the order would not prejudice any rights accrued before the order was made. The claimant’s solicitors (see para 38 below) submitted that the words in bold set out in para 35 above were accurate – because notwithstanding the terms of order with retrospective effect, D2 could still have defended the default judgment application by filing its acknowledgment of service and Defence late, and seeking permission to do so. I do not accept that submission. The prejudice consists of needing to apply for permission, when otherwise D2 would be able to rely upon a Defence filed at a time when it had not yet been served. I also note that orders for prospective service by alternative means, or extending the time for service would not have resulted in any prejudice to D2. Following provision of this judgment in draft to the parties, the claimant’s solicitors made written submissions as to paras 32 to 35 above; on the basis that Mr Mallinson’s witness statement was not in the bundle, and there was no consideration of it at the hearing. My reasoning in those paragraphs has taken those submissions into account; and the claimant’s solicitors confirmed that they did not wish to make any further oral or written submissions in respect of those paragraphs. If I am wrong in my conclusion in those paragraphs, in my judgment, the claimant’s counsel’s submissions nevertheless face the difficulty that as at the date when the first application was made, D2 had not in fact been served; and this remained the case when the first application was issued. The first occasion on which it could be said that D2 had been served was 6 August 2018. It was not therefore until 6 August 2018 that any time limits were in place for service of the acknowledgment of service or defence. By that date (and by the date of the application for service by alternative means) D2 had filed the Briffa Defence. The effect of retrospectively ordering service by alternative means cannot in my judgment have had the effect of depriving D2 of its right to defend the claim by reason of having filed a Defence before an order had been made obliging it to do so. The claimant was equally unsuccessful in the application to strike out the defence/summary judgment. The principles to be applied on applications for summary judgment are well established. They were summarised by Lewison J, as he then was, in Easyair Ltd v Opal Telecom Limited  EWHC 339 (Ch), in a formulation approved in a number of subsequent cases at appellate level, including AC Ward & Sons v Catlin (Five) Limited  EWCA Civ 1098 and Mellor v Partridge  EWCA Civ 477. It is unnecessary to set them out here. As to striking out for no reasonable grounds, as noted in the White Book (para 3.4.6), there is a considerable overlap between the court’s powers under CPR Part 24 and r.3.4. ; and the court has a discretion to treat an application made under CPR 3.4 (2) (a) as if it were an application under Part 24. In this case, there is no practical distinction in the test to be applied. So far as non-compliance is concerned, the claimant’s counsel submitted that the Mitchell/ Denton principles (Denton v TH White Ltd  1 WLR 3926) are relevant, in particular, the need for litigation to be conducted efficiently and at proportionate cost and to enforce compliance with rules, practice directions and orders. She relied upon Walsham Chalet Park Ltd v Tallington Lakes Ltd  EWCA Civ 1607;  CP Rep 15. This, she said, requires the court to apply the 3 stage test in Denton – (1) identify and assess the seriousness and significance of the “failure to comply with any rule, practice direction or court order”, (2) consider why the default occurred, and (3) evaluate all the circumstances of the case. “In a strike-out application under r.3.4 the proportionality of the sanction itself is in issue, whereas an application under r.3.9 for relief from sanction has to proceed on the basis that the sanction was properly imposed (see Mitchell at –). The importance of that distinction is particularly obvious where the sanction being sought is as fundamental as a strike-out. Mr Buckpitt drew our attention to the recent decision of the Supreme Court in Prince Abdulaziz v Apex Global Management Ltd  UKSC 64 at , where Lord Neuberger quoted with evident approval the observation of the first instance judge that “the striking out of a statement of case is one of the most powerful weapons in the court’s case management armoury and should not be deployed unless its consequences can be justified”. (3) No reasonable grounds for defending the claim. The claimant’s counsel made a number of criticisms of the various Defences, which the claimant’s lawyers unhelpfully referred to as “the First Purported Defence”, “Second Purported Defence”, “Third Purported Defence” and “Fourth Purported Defence”. (1) In each case, the document entitled “Defence” did not contain a statement of truth. (2) The statement of truth on behalf of the company D1 was invalid because there was no statement that D3 was authorised by D1 to sign the statement. This criticism is misconceived. CPR PD 22 provides that a statement of truth verifying a document on behalf of a company must be signed by a person holding a senior position in the company; and that person must state the position held. The claimant’s counsel did not refer me to any requirement to state that the person signing has been authorised by the company to do so; and there is no such requirement. (3) The D1/D3 Defence was not served on the claimant’s solicitors. This reflects the general position under CPR 15.2, which provides that a defendant who wishes to defend all or part of a claim must file a defence; CPR 15.3 provides that the consequence of not doing so is that default judgment may be entered. The rules (CPR 15.6) also require a copy of the defence to be served on the other party. But (as noted in the White Book at para 15.6.1), the rule does not impose a time limit by which service must be made, nor specify any consequences for the failure to do so. However, since this claim was issued in the Shorter and Flexible Trials Pilot Scheme, the defendants were obliged (by para 2.29 of PD 51N) to serve their defence within 28 days of the acknowledgment of service of the claim form. I accept that D1 and D3 were in breach of this provision; and that a failure to serve a statement of case is a serious or significant breach. The reason why the default occurred was the instructions on the form N9D forming part of the Response Pack served with the claim form. The breach was remedied by the service of the re-signed D1/D3 Defences on 11 April 2018, 2 months before the first application was issued. I also consider that, since the claimant was able to (and did) access the court’s electronic file, and obtained a copy of the documents filed by D1 and D3, it would be wholly disproportionate to strike out the defence for a breach of this type. The defendants were in breach of this requirement. I do not regard this breach as serious or significant; and, again, it would in my judgment be wholly disproportionate to strike out the defence for this breach. The claimant’s counsel criticised the re-signed D1/D3 Defences primarily on the ground that they were backdated to the date of the D1/D3 Defence. She referred to this as a “false date” because it was not the date on which the documents were signed. I am unable to find anything sinister in this, or that the defendants were seeking to mislead the claimant or the court. The date on which these documents were filed is plain from the court file: the defendants seem to have regarded themselves as filing a re-signed document that remedied one of the deficiencies identified by the claimant’s solicitors. It certainly did not falsify them or prevent them from being defences, as the claimant’s counsel suggested. (1) It was inappropriately verified. This is plainly (and regrettably) correct. It did not in my judgment prevent it from being a defence; the reference to “witness statement” was an obvious error. I do not consider this to be a serious or significant breach; albeit it is one for which there is no reasonable excuse. It would also be wholly disproportionate to strike the Defence out for this defect. (2) It failed to comply with para 2.30 of PD51N – I have already dealt with this. This, she said, meant that it was likely to obstruct the proportionate disposal of the proceedings. The claimant’s counsel did not identify the bare denials. The Briffa Defence is a 6 ½ page, 34 paragraph document setting out in some detail the basis of the defence. I do not accept that it is in breach of CPR 16.5. Finally, the claimant’s counsel relied on the fact that the re-verified Briffa Defence was not filed or served (it was only sent by email). So far as D1 and D3 are concerned, they required permission to amend their Defence; so the Briffa Defence (and the re-verified Briffa Defence) can only be regarded as their proposed draft amended Defence – though permission to amend was not sought from the claimant or the court. So far as D2 is concerned, the Briffa Defence was the first occasion on which it had filed a Defence. I do not consider the non-filing of the reverified Briffa Defence to be a serious or significant breach, nor a ground on which to strike it out. As for D2’s failure to serve the Briffa Defence or re-verified Briffa Defence, I accept that this was a significant breach of the rules, but for the reasons given above, not one that would justify striking it out. For these reasons, therefore, the claimant’s application does not succeed on the first ground. The claimant’s counsel submitted that the D1/D3 Defence (and D1/D3 re-signed Defences) were likely to obstruct the just disposal of the proceedings. b. The claim is “Extra Petitum”, which appears to be a concept in other jurisdictions akin to ultra vires, where a court decides to grant relief in a matter beyond the relief requested. This is irrelevant here. It appears to rely on the existence of the opposition procedure at EUIPO, but is unclear (Para. 2). c. D1 & D3 seek relief, but not by way of counterclaim. This includes relief that the claim be dismissed, that it be suspended until after the conclusion of the EUIPO proceedings, that costs be awarded against [the claimant] for a “non-legitimate Law procedure” and that D1 and D3’s costs be paid by [the claimant] (Numbered paras at bottom of p.2). d. The claim is unlawful and infringes “Free Competition Principles of the EU Comment Market” [sic] (Para (1) on p. 3). e. The application for the EU trade mark (presumably relying on D2’s application) is guaranteed under Art. 1 Protocol 1 of the EUCHR and does not violate [the claimant]’s rights (Para. (2) first section on p.3). g. Trade Mark infringement requires a likelihood of confusion and an obvious risk of future harm and this is confirmed by contrary evidence. The prima facie evidence is missing and cannot be presented because of the existence of the Registered Design and the EU TM. h. There is no likelihood of confusion because of the phonetic differences between the words RED BULL and BIG HORN. It exhibits, and relies upon, the submissions of D2 in the opposition proceedings (as mentioned above, this was not in the bundle). I accept that the allegations set out at paras a, b, d, e and i disclose no real grounds for defending the claim and should be struck out. As for the relief sought by D1 and D3, the application for a stay is now made by application notice, and it is unnecessary to set out a claim for costs in a statement of case. I accept that ownership of the community registered design does not entitle D2 to positive rights to use the design (or the signs on it), but only to restrain others from doing so without its consent; and accordingly, that the allegation set out in para f should also be struck out. 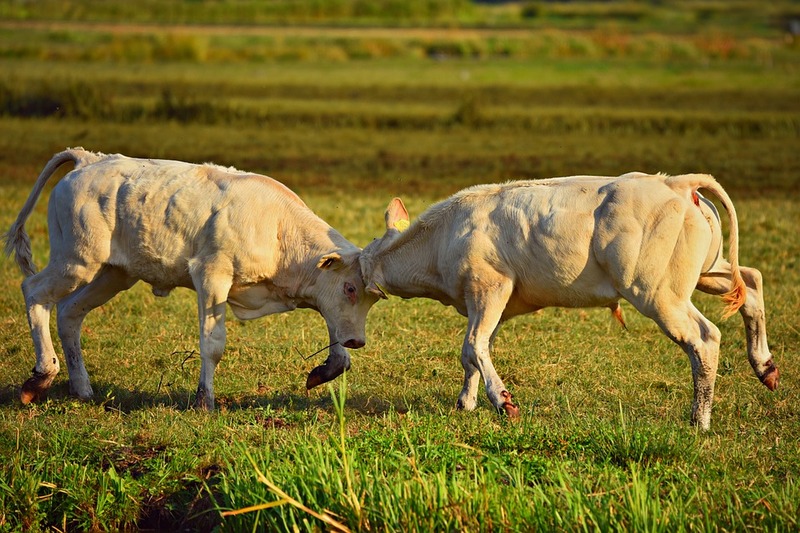 “In the earlier trade mark, two bulls race towards each other with their heads lowered, and they are about to collide. The Bulls have two comparatively short horns on their heads. Between the animals, a circle is depicted in the background, showing the same distance between the animals entering the circle takes place in the lower part of the presentation the tales of the animal stand upwards which gives the viewer an impression of tension. Colours are not claimed. The contested mark shows graphic design elements in the upper part and a word combination in the lower part. All components of the sign have the colours black and yellow. Within the upper part, a sun or yellow circle is shown, which is interrupted at the bottom by a mountain landscape. This mountain range depicts different heights and levels, which are higher towards the centre. In the middle or upper part, to animals jump towards and touching each other. The leap goes clearly upwards in in such a way that the mountains are exactly between them. Striking are the strongly rounded and large horns, which form a clear curve on the heads. Obviously, these are mountain ibexes living in the mountains, their typical habitat. The words “BIG HORN” in the lower part of the mark also have a slight oblique font and are slightly longer than the one above. The hind legs of the two animals are slightly behind the representation of the mountain landscape. The element “BIG HORN” of the contested sign will be understood by the English speaking public with that meaning. As it is not descriptive, allusive or otherwise weak for the relevant goods, it is distinctive. For the rest of the public, it is meaningless and, therefore, also distinctive. Visually, as previously stated, the representations differ in the manner of displaying the animals, the background, the composition of the marks, and the additional colours of the contested mark. In addition, the species are clearly different, namely two bulls in the earlier mark and two ibexes in the contested mark. Furthermore, the contested mark with the representation of the mountain landscape and the words “BIG HORN” has components that the earlier mark does not have. The fact that two apparently different animals move towards each other is not sufficient for a finding of similarity. Therefore, the signs are visually dissimilar. Conceptually, the earlier trade mark is described as a sign in which 2 bulls (fast) move towards each other. The contested mark is a mountainous landscape against the background of a son/yellow circle, with 2 ibexes starting to jump. The meanings of the signs therefore go in different directions, so that they do not overlap in the possible interpretations by the targeted public. They are therefore conceptually dissimilar. For the English-speaking consumers, the additional word combination “BIG HORN” differs from the earlier mark, so there are additional differences in this respect. In those circumstances it was not necessary for the tribunal to move on to consider the likelihood of confusion or link, or the other elements of the opposition under Art 8(5).